I KNOW what some of you are thinking. Do we really need ANOTHER festival in this city? Well, if that was what you were thinking, then I'm here to tell you: YES! I mean sure, we have the Fringe, Folk Fest, Capital Ex, the EIFF, Street Performers, Heritage days, The Works, Blues Fest, the Dragon Boat Fest, Global Visions, the International Jazz Festival, the White Light, A Taste of Edmonton, NextFest, Symphony Under the Sky, Ice on Whyte, DEDfest, Cubamemucho, Exposure, Creative Age Festival, the North of Nowhere Expo, Chante, the Literary Festival, dEdmonton, Improvaganza, Ink Fest, Original Fare, the Vocal Arts Fest, Summer Solstice, PoFest, the International Children's Festival, Silver Skate, Serca Fest, the Alberta Drama Festival, Dreamspeakers, the Feats Festival of Dance, Cariwest, the Rivercity Shakespeare Festival, the Rocky Mountain Wine & Food Festival, Heart of the City, Festival of Beer, Celtic Fest, the Sourdough, Scarecrow Festival, the Historic Festival, and even the Canadian Birkebeiner Ski Festival, but, there's always room for more, no? Yes, admittedly, Edmonton's festival season--which is all year long, really--is seemingly a bit crowded, but even with that parade of festivities above, there's nothing quite like the new kid on the block, SOS Fest! Again, I know what you're thinking. What could this new kid possibly have that the plethora of others don't? Well, let me to you. SOS, which is short for Sounds of Old Strathcona (as in Whyte Ave.), is a brand new, potentially annual event that will invade the area this upcoming weekend (Friday, July 9-Sunday, July 11). More than 20 in-scope venues (as well as two outdoor stages) will host more than 150 indie acts mostly from the Edmonton area, though others are visiting from B.C., Saskatchewan, Manitoba, Toronto, Whitehorse, and in the case of Yoav, New York City. There'll even be some Calgarians welcomed to the show...but after they're done performing, they have to leave and go back home. Seriously...don't stick around Calgarians! (I joke, Calgary, you know we heart you, too!). But it's not just that there's so many acts lined up to perform for Strathcona patrons that makes SOS special. The numbers are impressive indeed, but it's also the wide range of musical styles that will be represented at SOS this upcoming weekend. The Folk, Jazz, Blues, and Celtic fests, unsurprisingly, focus on one particular genre of musical talents, whereas SOS will gather enthusiasts of folk, rock, pop, country, metal, jazz, hip-hop, new age, contemporary, electronic, punk, R&B, classical, blues, gospel, and even world music. So everyone is satisfied! With that said, don't expect any "big-name" acts at SOS, but rather local and independent artists who could use your support. In fact, many of Edmonton's best-known musicians will accompany the marquees, including Cadence Weapon, Ann Vriend, Captain Tractor, Bill Bourne, Jeff Stuart & the Hearts, The Wheat Pool, Erica Viegas, Ten Second Epic, Politic Live, Mikey Maybe, Darryl Matthews, and the man simply known as The Joe. Not too shabby! For a complete list of performers click here. One noticeable omission, though, was the beautiful Kaley Bird (pictured left). 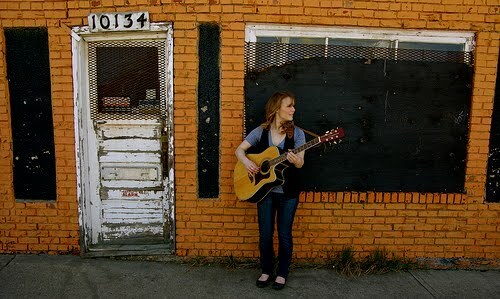 The Edmonton-based singer-songwriter is well-known for her passion for music, whether it be writing it, performing it, or simply listening to it. Since her humble beginnings in the basement of her city home, Bird (who's real name is Kaley Beisiegel) has gone on to tour the nation, charted on national campus radio, played the legendary Edmonton Folk Festival and, in '08, released her self-titled debut album. Last year Bird was even selected as one of "Alberta's Hidden Gems," as part of an ACCESS television production. I actually saw Bird in concert myself when she opened for Michael Bernard Fitzgerald (who will also be at SOS) at the Starlite Room last February. She put on a great set that night, no doubt, but little did I know that this Bird was about to lead the way for one of this city's most intriguing ideas in years. So why isn't she playing the SOS, you ask? Because she's too busy organizing it! That's right, alongside a dedicated group of fellow volunteers (Brandi Sidoryk, Brette Sidoryk, Megan Young, Amy Thiessen, etc., etc., etc. ), Bird was approached to help put together a unique opportunity for not only indie musicians to converge at a communal region for three days of performances, but for Edmonton to realize its own backyard talent, too. Organizers are also hoping that the focus on a sustainable community of musicians and promoters will continue even after the inaugural festival has ended, and "eventually just get people excited [about consuming] music year-round," said Bird. "And to create this place and atmosphere where people come down to Whyte Ave and Old Strathcona to consume live music throughout the year, not just...when SOS Fest is happening." SOS will coincidedly promote Strathcona itself, and lend a spotlight to its safe, healthy and vibrant community, one that has been questioned over the years, due to late night crowds and rowdy sports-related rioters. It'll serve not just to stimulate the region, but celebrate it as well. And that's why so many area venues have jumped on-board, some even risking upsetting their regulars who'll have to pay a cover during the weekend showcase, when door charges had never been an issue prior. I'm sure habitual patrons and newcomers alike will be more than happy to shell out the $10 door charge per concert, though (see below for other ticket options). Proceeds will go to benefit both War Child and the Alberta Music Education Foundation (which provides funding for innovative ideas for music education in our communities), as well as a portion to compensate the artists themselves. Trust me, many--if not most--of them rely on these shows for their livelihood... remember, no major label acts will take to the stages Friday through Sunday. As for the venues they'll rely on drink and dining tabs during the festival. Amongst those who'll contribute space to SOS are the Pawn Shop, Wunderbar, the TransAlta Arts Barns, Filthy McNasty's, Ironhorse, Blues on Whyte, Black Dog Freehouse, Cook County Saloon, the brand new Lyve on Whyte, and the soon-to-close Megatunes. I'll be volunteering my precious time on Saturday at the Accent European Lounge (8223-104 St.), and then on Sunday at the 105th Street outdoor stage. For a complete list of the venues click here. So, if you're not yet sold on why you should spend your hard-earned (or hardly-earned, whatever) dollars at Edmonton's newest and most diverse festival yet, the SOS Fest, you can learn more about the artists at the official website, or by visiting them on Facebook or Twitter. A wristband will set you back just $30 ($15 for youth/ 17 & under), and will allow you access into ANY concert during the 3-day event. Tickets can be purchased online at yeglive.ca, or in person at Blackbyrd Myoozik. Or, as I've already mentioned, individual shows are only $10 per person, though are subject to venue capacity. Wristband holders have priority entrance. Here's your chance, Edmonton, to take in or be part of not just a brand new festival, but an emerging concept in both celebrating local music and promoting one of our city's most beloved communities. Come join us and listen to the diverse Sounds of Old Strathcona (July 9-11). For a complete schedule of SOS Fest 2010 click here, or see it in the July 8th issue of SEE magazine. Programs will be available on Friday, July 9 for only $1. P.S. 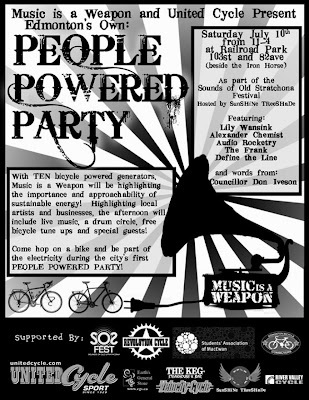 Click here to read more about the Fest's "Music Is A Weapon" party on Saturday, July 10, where local bands will perform on a stage completely powered by stationary bicycles. Labels: Kaley Bird Michael Bernard Fitzgerald Music Is A Weapon SOS Fest Sounds of Old Strathcona Whyte Ave.